Samsung has confirmed it will soon release refurbished versions of the ill-fated Galaxy Note 7 - the phablet that caught fire in several cases last year - but certification for the new phone may prove a problem for Samsung. South Korea is rumored to be the first market the company will release the new Galaxy Note 7 in, but the latest report claims the company has yet to apply for certification from two Korean agencies. 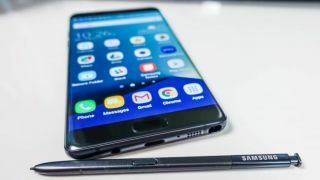 The company will need permission from the Korean Agency for Technology and Standards as well as the National Radio Research Agency to be able to release the device in South Korea. That may be a major stumbling block for the company considering the issues Samsung had with the original Galaxy Note 7. Samsung hopes to help limit the environmental impact of disposing of millions of Galaxy Note 7 devices it currently has in storage by releasing a refurbished version. Rumors so far suggest the new Galaxy Note 7 will have the same specs as we saw on the original device, but will pack a slightly smaller 3,200mAh battery to ensure the device doesn't catch fire again. Whether the new Note 7 will come to the US, UK or Australia is currently unclear, but we can be pretty certain Samsung will be releasing the long rumored Galaxy Note 8 worldwide later this year though.